Liferay projects can contain multiple plugins. If you’ve followed the instructions from the earlier section on creating new Liferay projects, you should already have created the event-listing-portlet project. In this section we’ll add two portlets to the event-listing-portlet project: the Location Listing portlet and the Event Listing portlet. This illustrates the general process for creating plugins inside of an existing Liferay project. Later in this guide, when we complete developing the Event Listing and Location Listing portlets, they’ll allow users to add, edit, or remove events or locations, display lists of events or locations, search for particular events or locations, and view the details of individual events or locations. For now, we’ll show you how to create both portlets in the event-listing-portlet project. But before we do, let’s clean out the bare-bones default portlet from our event-listing-portlet project. The portlet project wizard conveniently creates a default portlet named event-listing-portlet after the project’s name. The portlets we’ll create in this section will be named locationlisting and eventlisting. To avoid any confusion between the project’s default portlet named event-listing-portlet and the portlet we’ll be creating named eventlisting, let’s remove the default portlet by removing its descriptors and it’s JSP. Open the portlet’s docroot/WEB-INF/liferay-display.xml file and remove the <portlet id="event-listing" /> tag. Open the docroot/WEB-INF/liferay-portlet.xml file and remove the <portlet>...</portlet> tags and code residing between those tags. Navigate to the docroot/WEB-INF/portlet.xml file and remove the <portlet>...</portlet> tags and code residing between those tags. Super! You’ve cleaned out the default portlet from the project. Now you’re ready to start creating the example plugins. Your Liferay IDE’s Package Explorer shows your Event Listing plugin project. Since it’s a portlet type project it has a skeleton in place for supporting more portlet plugins. Let’s start by creating the Location Listing portlet. 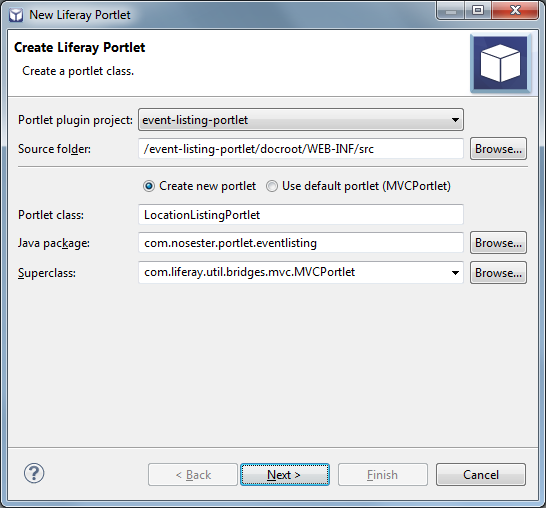 Right click on your event-listing-portlet project in Liferay IDE’s Package Explorer and select New → Liferay Portlet. The New Liferay Portlet dialog box appears with your plugin project event-listing-portlet selected as the Portlet plugin project by default. It’s a good idea to name your Portlet class after the name of your portlet. We’ll name the class LocationListingPortlet in this example. Name your Java package after the plugin’s parent project, so it will be com.nosester.portlet.eventlisting, and leave the Superclass as com.liferay.util.bridges.mvc.MVCPortlet. Alternatively, you could have selected com.liferay.portal.kernel.portlet.LiferayPortlet or javax.portlet.GenericPortlet for your superclass. 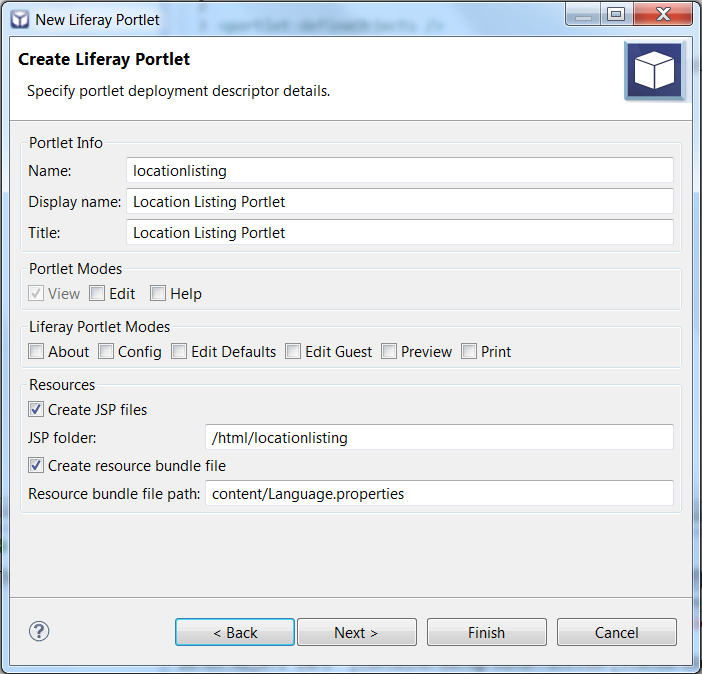 Figure 10.7: Liferay IDE’s portlet creation wizard makes creating a portlet class is easy. In the next window of the New Liferay Portlet wizard, you’ll specify deployment descriptor details for your portlet. First enter the Name of your portlet–in our example, this will be locationlisting. Next, enter the portlet’s Display name and Title; we’ll specify both as Location Listing Portlet. In this window, you can also specify which portlet modes you’d like your portlet to have. View mode is automatically selected. There are also options for creating resources: you can specify the folder where JSP files will be created as well as whether or not a resource bundle file will be created. We’ll leave the Create JSP files box flagged, specify html/locationlisting as the JSP folder, and flag the Create resource bundle file box. Figure 10.8: Liferay IDE’s portlet creation wizard let’s you specify the deployment descriptors for your portlets. The last step is to specify modifiers, interfaces, and method stubs to generate in the Portlet class. Accept the defaults and click Finish. Right-click your event-listing-portlet project → New → Liferay Portlet. 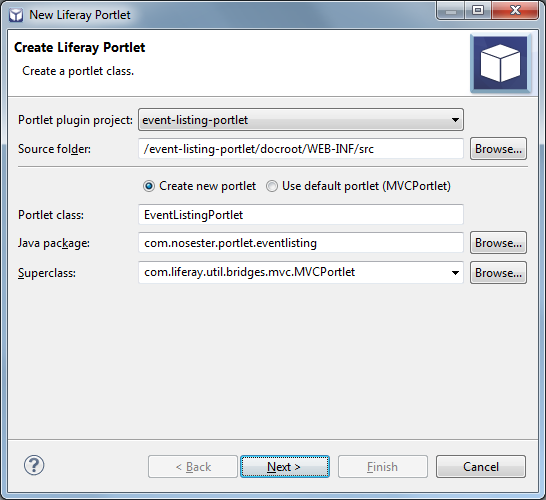 Specify EventListingPortlet as the name of the portlet class, enter com.nosester.portlet.eventlisting as its Java package, and select com.liferay.util.bridges.mvc.MVCPortlet as it’s superclass. Figure 10.9: Creating portlet classes is simple with Liferay IDE’s portlet creation wizard. In this window we’ll specify the portlet’s deployment descriptor details. The last step in creating your portlet with the wizard is to specify modifiers, interfaces, and method stubs to generate in the Portlet class. Accept the defaults and click Finish. By default, new portlets use the MVCPortlet framework, a light framework that hides part of the complexity of portlets and makes the most common operations easier. The default MVCPortlet project uses separate JSPs for each portlet mode: each of the registered portlet modes has a corresponding JSP with the same name as the mode. For example, edit.jsp is for edit mode and help.jsp is for help mode. Let’s redeploy the plugin project to make our portlet plugins available in the portal. In the Servers tab, simply right click the event-listing-portlet project, then click Redeploy. Now you’ve created and deployed the Location Listing portlet and the Event Listing portlet from the same project. Eventually, when the Location Listing portlet is complete it will allow users to enter viable event locations. If you’ve been following along to create the Event Listing portlet project, you’re done! Next, let’s find out how to import existing projects into Liferay IDE.